There are many skimming solutions and oil removal systems available for different oil-on-water situations. Each scenario may require a different solution, but in many cases, the solutions our experts recommend include a Brill® oil skimmer with a Free-Floating Collector Tube®. Tube skimmers run on a simple concept: continuously remove oil from the surface of the water using a closed-loop collector tube that floats on the surface of the water, attracting the floating oil or grease. They are flexible, easy to install, and low maintenance. 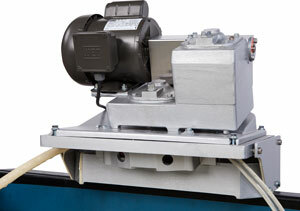 In this video, see one of our tube-type oil skimmers in action: the Model 5H. This unit is used for above ground tanks, parts washers, and other applications where the skimmer can remain within three feet of skimming area. In the demonstration, the team pours five gallons of oil into the water. See how the collector tube floats and oil adheres to the outside of the tube— collecting only oil, leaving the water behind—and the oil is removed from the tube as it passes through the skimmer.